If you don’t do anything else this year to improve your website performance, you MUST take a look at your page loading speeds. Just a short time ago, Google announced that they WILL factor page load speed into search ranking for mobile results. And guess what? They have also started moving websites over to their Mobile Index. You may have already seen the notification that your site is now being ranked based on your mobile site, instead of the desktop version (regardless of what the user is using to search for results). You MUST have a responsive, well-built mobile site with search engine optimization. You MUST make it fast. It’s not likely that your visitors are going to go, “Wow, this site is fast. Let me buy their stuff.” However, it is likely that they will get frustrated and leave if the browsing experience isn’t smooth, seamless, and instantaneous. According to a 2009 Akamai study, 47% of visitors expect a page to load in under 2 seconds, and 57% of visitors will abandon a page that takes more than 3 seconds to load. So how does your site measure up? You can test the speed of your website by using the Website Speed Test Tool. What did that tell you? Does your site load in under 5 seconds? That seems to be the cut-off for “Top Performing Sites” according to Google. There are many “nerdy” things you can do to speed up a site, but let’s first focus on the top 5 speed hacks that create the biggest impact on your site’s speed. 1. Not all Web Hosts are the same! Your web host can make a huge difference. In most cases, speed issues are caused by a bottleneck on your web hosts server. If you have a WordPress site, we fully recommend WPEngine. We host on WPEngine and have seen sluggish sites’ load times cut by 50% to 70%. 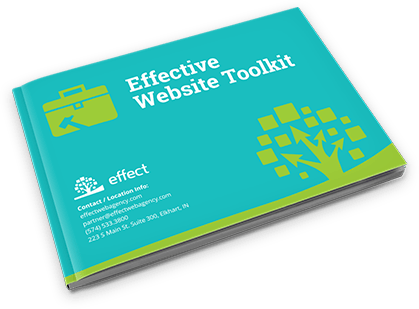 (Effect can host your site through our account at a reduced price. Call us for details). If you don’t have a WordPress site, we recommend finding a web host that uses SSDs – solid state hard drives, because they are much faster than conventional drives. Also, ask your new host to enable the “Keep-Alive” setting. This allows visitors to download many files at one time rather than making a new request for each file. This definition found on WordPress explains what we mean by leveraging your browser cache pretty clearly. If you have a WordPress website, then you can use the WP Total Cache plug-in to do this for you. If you host with WPEngine, you will not need to use this plug-in because they have a built-in cache. For those without a WordPress website, you should find a quality web host that has a caching feature built into their service. Basically, with a CDN, copies of your website content sits on servers all over the world. When someone tries to load your website it pulls that content from the server nearest to them, thus cutting down the time it takes to load the site. If you are hosting with WPEngine, then you can simply activate the CDN from your Control Panel. Otherwise, if you want a free CDN service, you may want to check out CloudFlare. Unoptimized images can be 10X – 100X bigger than they need to be, and take that much longer to download, using up a large amount of bandwidth on your site. You can manually optimize images to the correct size, or if you have a WordPress site, you can install the WP Smush.it plugin to automatically compress images as they are uploaded. The quality of the image remains the same, and the plugin can compress images already in your media library. Pick a URL format and stick with it. For example, if you are using https://www.domain as the preferred version then by all means, put that “www” in front of all your image URLs. Extra redirects between WWW and non-WWW URLs add load time. These 5 Tips for speeding up your website are just the tip of the iceberg. We’ve put together a checklist of items that our developers can use to improve your page loading speeds even more. Remember, Google has made speed a priority. The websites that address the issue now won’t have to worry about possibly losing rank or traffic later. Also, website visitors expect you website to perform well. If you want qualified leads, you need to keep people onsite long enough to convert. If you have any questions about how this new Google speed update pertains to you, contact Effect Web Agency. We continue to serve web clients in Goshen, Indianapolis, and across the United States. Our goal is to help you grow your business.